This amazingly eerie shot sent in by a Jalopnik reader isn't a production still from the movie The Day After Tomorrow. 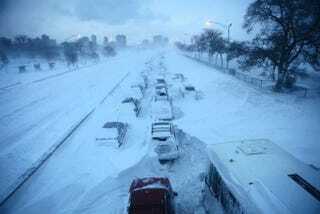 No, it's actually Lake Shore Drive in Chicago this morning after over a foot of snow fell overnight in the Windy City on Lake Michigan. See, and this is why I still live in New York City. At least here our snowpocalyptic scenes are just in Brooklyn and involve poorly placed Metropolitan Transit Authority buses, taxis and ambulances. Lots of ambulances. WHy they think they can traverse the snow is anyone's guess. But we digress — this shot above is absolutely amazing. One more amazing shot below. Is that a brand-new 2011 Ford Explorer? Why yes, yes it is. 2011 Ford Explorer: Capable. Utilitarian. Frozen in the snow. UPDATE: The image on top is actually from the Chicago Tribune. The second photo's from the New York Times.